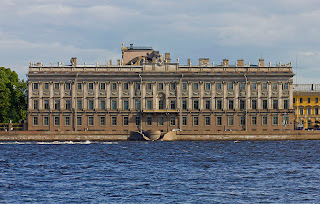 The Marble Palace in St. Petersburg is located on the Palace Embankment [Дворцовая набережная] with the north side facing the Neva and the south on Millionnaya Ulitsa. It was built the architect Antonio Rinaldi in 1768-1785 as a gift by Catherine the Great for her lover Count Gregory Orlov. 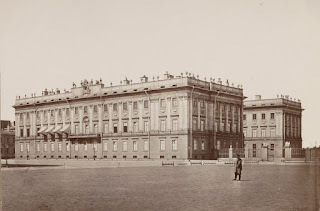 He died two years before its completion and the Empress later gave the palace to her grandson Grand Duke Konstantin Pavlovich when he married in 1796. 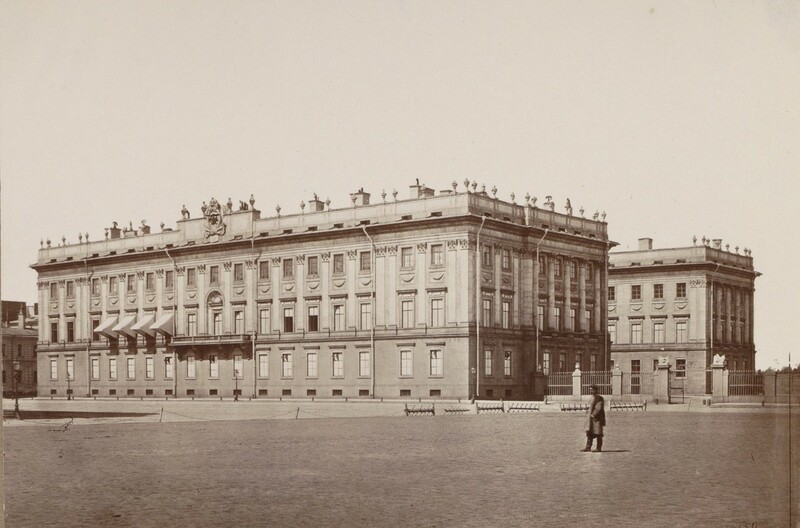 After his death in 1831, Emperor Nicholas I designated the palace as the future home for his second son Konstantin and his descendants. Aerial photograph (below) of the Marble Palace in the lower left. The palace is to the right of the inner courtyard, and the servants/stables building on the left. An 1849 guidebook described the Marble Palace’s “long façade, stretching by the river side, denotes that it must have been at one time a handsome pile of building. 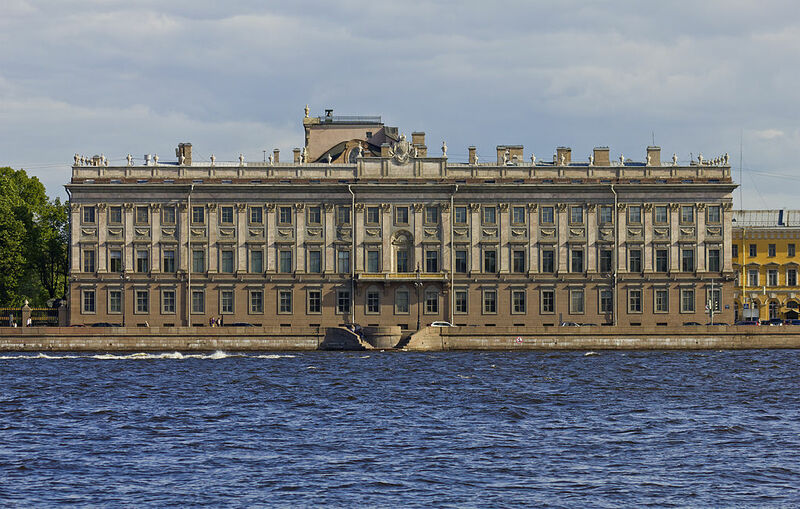 Without doubt everyone on hearing this name will picture to himself an elegant, white, gay-looking palace, shining from afar like a temple of Solomon, on the banks of the Neva, and will be not a little astonished to find it a dark fortress-looking building. Such at least is its appearance amongst the cheerful shining palaces of St. Petersburg, though it might not be so striking in gloomier cities. It ought more properly to have been called the Granite Palace, for much more granite and iron have been employed upon it than marble. The extraordinary massive walls are built of blocks of granite; the supports of the roof are iron beams,; the roof itself sheet copper; the window frames gilded copper”. In current guidebooks, the Marble Palace has been described as a masterpiece of Neoclassicism and one of the loveliest buildings in the city. The handsome exterior comprises a rather subtle, harmonized combination of different marbles and granite”. Am I influenced by knowing the tragedy of the Grand Dukes’ family life behind the dark granite walls? Joanna. I had no idea that this place existed! What's in it now,its obvious not apart of the Hermitage? 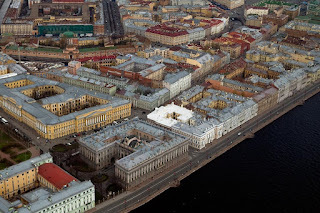 Today the Marble Palace is part of the Russian Museum which is located in the beautiful Mikhailovsky Palace.